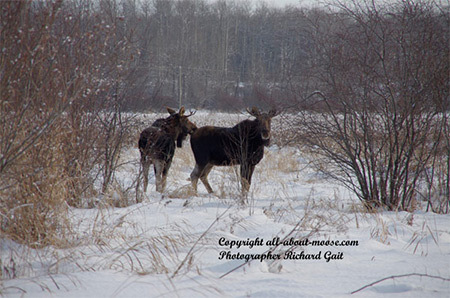 I am Richard Gait from Italy, the photographer, and I have taken these pictures of moose in Alberta, Canada, near Edmonton in early December 2012. Currently I am staying at a place called the Wild Horse Ranch, where I am working on documenting semi-wild horses and a unique horse training method. I was about to open the gate to the ranch one morning when Pat, the owner, spotted moose up and on the other side of the road. I was quite excited because I had never seen moose before in my life! Carrying my camera, a PENTAX K-5 DSLR, everyday for the past couple of months I had the right equipment to record this first encounter. 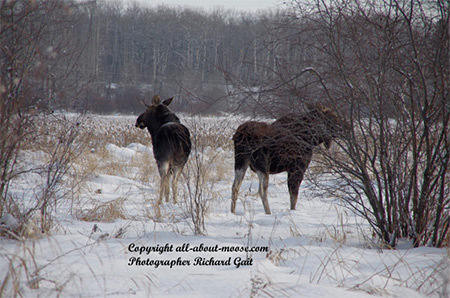 I walked down the ditch to a wooden fence and I looked at the two moose which I later found out were in fact 2 young males! Pat drove his Ford pick-up up the road to turn around, and as he was away I decided to cross the fence to get a better shot of the two wild animals. This was because I couldn't get a proper shot from behind the fence, as the lenses I am using don't allow much optical zoom. 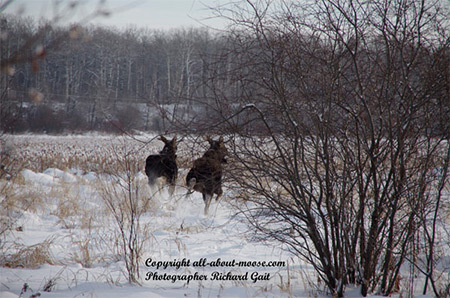 With them lenses stretched to 135 mm, I started to walk in the fresh snow up to the moose that were pretty much minding their own business! All of a sudden I am surprised by the fact that one of the two mounted the other and I was fast enough to get good pictures of moose doing that, which is apparently a rare event to witness when it comes to wild moose. I was told by Pat on his return that I had made quite a mistake to cross the fence and approach the moose, as they could have charged me! Fortunately though that didn't happen, so that very night I decided to investigate the matter and I was so fortunate to stumble on Mark's website allaboutmoose.com! I wanted to know about this interesting behavior and Mark asked two colleagues, a researcher and a biologist, about it and they both gave me some great feedback about my pictures of moose. Also, I am especially glad that my moose pictures have found such a good home! Hi Mark – a most interesting questions - yes, it does happen and I have a video of two young bulls in such a position and the one has quite an erection – one bull was about a year and a half the and the other was a 2.5 year old - it was the latter one who did the mounting and once on the younger one the younger moved away. Yes I have witnessed that action several times in the wild. It usually occurs during the rut and often is with young bulls 1 1/2 tp 3 1/2 sometimes with older bulls with inferior racks. I believe it is out of sexual frustration as well as (with dogs) trying to show dominance over another male. I saw it once in Nov between two fairly decent bulls when I cow-in-heat called to them. They both came to me could not find the cow and the larger of the two mounted the other one. Not all that uncommon in my mind but whenever I have seen it never had a camera. Kudo's to the guy that actually got pictures of moose in that position. 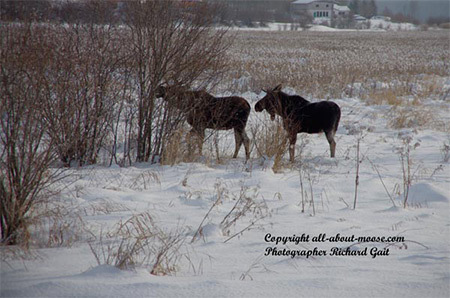 I want to thank Richard for his contribution of pictures of moose to the All About Moose website. There are strange animal behaviors that are sometimes witnessed and seldom photographed and this is one of those times. 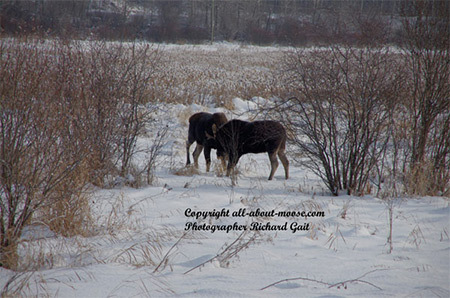 I would not go as far to say these moose were having same gender relationships, but rather as Dave mentioned... working out frustrations. 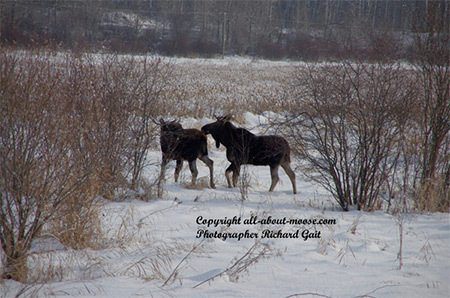 Animal ethologists may have an better explanation, but I doubt if moose have homosexual tenancies.